The year began with the hanging of one man and ended with the drowning of another. Miss Renshaw suggests to her class of eleven schoolgirls that they are going on an excursion to the gardens to think about death. The kids, however, think that their teacher just wants to meet Morgan, the gardener who takes care of the plants in the garden and who, according to Miss Renshaw, writes a lot of poems. At the park, Morgan mentions the ancient caves where the aborigines carved a lot of paintings. Even though some kids don't want to go to the cave, their teacher insists that they all visit the cave. Once inside the dark cave, the girls panic and scramble their way out of the cave. Miss Renshaw asks them to wait but they are too panicky to listen. Outside, they sit and wait for their teacher; only she doesn't come out. They wonder if she is lost, or if they should go back in and look for her, but they are too scared to do so. Some of the girls want to head back to their classes, because it's snack time soon, but most of them wonder if it is appropriate for them to return to class after losing their teacher. Whoever heard of students losing their teacher? The Golden Day is told from the perspective of eleven girls, but mostly Cubby. Kids as young as her make for an interesting observer because they see things they don't understand and sometimes cannot fathom the significance of what just happened. When Miss Renshaw fails to come out of the cave, they start worrying. They wonder if maybe Morgan and Miss Renshaw got out through another exit. Maybe they are just hiding in there. Or maybe they are lost inside the cave. But eventually, after weeks of waiting, they accept that Miss Renshaw may never come back. They haven't yet embraced the notion that maybe she is dead though the thought hangs in the air; her not coming back is a sufficiently tragic thought. The teachers sense that they are not telling the whole story of what happened, but Miss Renshaw had made them promise not to tell anything and they didn't want to break that promise, even if it meant stressing out everyday about the what-ifs. I thought the first half of the book was slightly dragging. It was definitely a fast read though. Once Miss Renshaw goes missing, the pace picks up, with the characters wondering what could have happened. 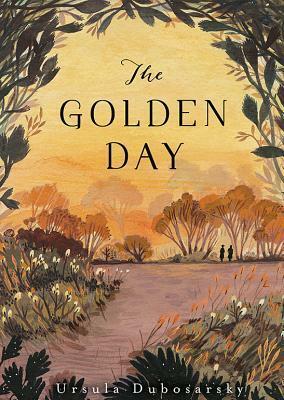 The Golden Day has a very poetic narration. There is so much atmosphere and emotions in this tiny book. Having a kid as the narrator means seeing the world a little differently - feeling captivated by colors and butterflies and lovely grass; not feeling it very odd that Miss Renshaw likes to meet Morgan very often; happily skipping away when she sends them off to write poems while she sat and spoke to him. Kids worry about different things - going back to class without their teacher worries them because how can they explain that they lost their teacher? Especially, when said teacher told them not to reveal certain things? The author shows how the little innocent things that adults don't think twice about, can upset kids. Dubosarsky explores how ambiguity and lack of closure can weigh a person down, especially with kids. Very often, when a tragedy happens, it is easy to forget the kids who bore any kind of witness, with the adults being busy solving crimes and occasionally remarking that the kids are suffering. The author actually focuses on the kids here - their worries, fears, and behaviors. A classmate of Cubby's provides practical and sensible arguments most of the time, but when it comes to her dead mother, she prefers to believe that the mother is abroad. Another girl cries all the time at the smallest triggers. Even for the reader the book ends ambiguously. Did Morgan murder Miss Renshaw? Did they run away together and are they still alive? Or was Miss Renshaw's plan to think about death in the park an ominous hint of a planned suicide? We will never know and the deliberate ambiguity is pretty clever - to follow that of the children's and compare our reaction to theirs. Are we just upset in not knowing what happened? What about the kids? Wouldn't they be traumatized? This sounds good even though I can't imagine taking kids out to think about death. I thought you were going to say she showed up weeks later and had them do a post assignment about death and what they thought about her when she was gone. I think the ambiguity in this book almost killed me especially with a certain scene at the end. I felt traumatized but in a good way since the author's writing was so brilliant. *whispers* You called this book The Golden Age in your title and link. This sounds wonderful. A bit odd but I like the idea of an ambiguous ending. Sometimes there are writers who can really make that work in a book. Great review! Great review! This is going on my to-be-read shelf. I like the idea of an ending that is left ambiguous, as long as the story is put together well. Having some ambiguity rings true to life and gives the reader room to let their imagination take over.